Carl has outdone himself yet again, and all whose so-called unreasoning, prejudicial complaints in re Carl’s behavior, lodged against his “mother,” Goat Whisperer Lance; are united today to celebrate a minor, yet joyous vindication. It reminds me of the time my ex insisted his unbelievably car-phobic dog was too car-trained, and his spectacularly ill-fated attempt to prove his point by having the dog ride in his brand new Jag. Oh yes, vindication is sweeeet. Carl has taken to wondering south, lately; all by himself… (a very ungoatlike thing to do) and browsing down to the packing house where the weeds and treats have proved to be less impacted by other, less trail-blazing, munchers. Although a known break-and-enterer up here by his barn (which means that young and old, residents and visitors alike must, without fail, remember to BOLT all exit doors or Carl will end up in the living room or his head in my recyling bin), Carl has found enough trouble to get himself into locally, and hasn’t ventured south by more than a few hundred feet. Complaining about Carl has met with his mother’s insistence that it’s not provably Carl’s fault. Or that he’s being profiled. Yes, that was actually a position taken. Or that, if it is Carl’s fault, not that that point is conceded…but if he is involved in an incident, he’s helped us all become more situationally aware. My favorite. Or the post goat break-in wreckage that is my living room maybe isn’t any goat’s fault, as in who knows maybe one of your teens left it like that….. 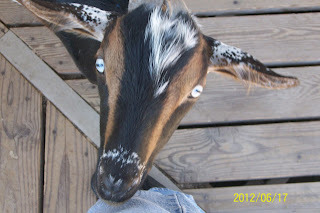 So the discovery this morning of Carl’s intrusion into the Goat Whisperer’s office is cause for celebration. Good boy Carl! The really important papers are on the desk, and oooh, the books in the shelf are sacrosanct.